Today, I came home from work to discover a package had arrived at our new home. Our very first one! 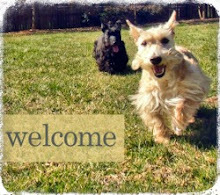 In it was a beautiful, handmade Scottie tote made by one of our loyal followers, Mindy Voelker, who kindly sent it to us as a housewarming gift. 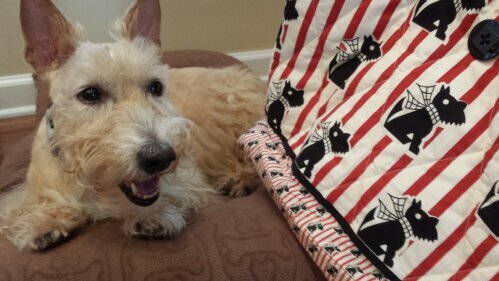 As you can see from her smile, Heather was very happy to see her friend Hootie and his Scottie Mom sent her such a fashionable gift! It was such a sweet gesture and I'm humbled someone would take the time to handcraft something like this as a random act of kindness for someone else who is essentially (but not quite!) a stranger. This just goes to show you how Scottie Love unites people across borders! Rest assured this bag will go to good use, Hootie and Mindy. Sooner than later, too! Many thanks for your kindness. Perhaps we'll get to pack it full of treats and toys for an afternoon play date with Hootie one day. Paws crossed! 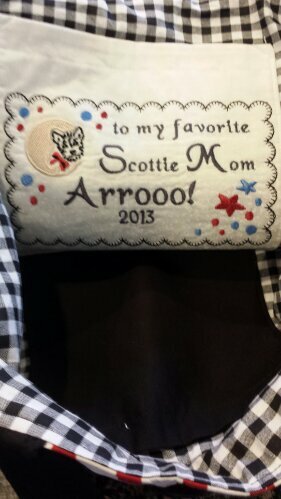 Much love from the Scottie Mom and family. It's a great gift. Check your email-I've sent you a msg. Hey Kyla - just checked. Nothing there. Can you try again? 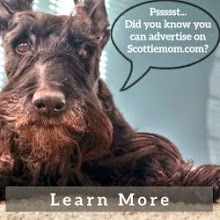 Email TheScottieMom(at)gmail(dot)com. Talk soon! This is just beautiful! I have a collection of Scottie totes . . . and Scottie figurines and Scottie earrings and Scottie socks and Scottie mugs and Scottie children's books and Scottie . . . .
OK, sent an email. I originally sent it to an address that had a "90" in it-my bad. What a lovely gift!!! Yes, Scottie Love unites people!! !